Multiscreen TV viewing refers to a spectrum of media productions that can be watched using TV and companion screens such as smartphones and tablets. In the last several years, companies are creating companion applications to enrich the TV viewing experience, but viewers are demotivated to consume them because they have to download dozens of second screen applications. 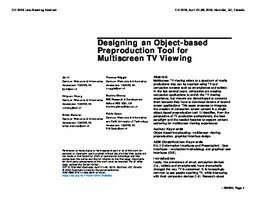 This paper proposes to integrate the creation of companion screen content in a single object-based preproduction tool. It identifies, from the perspective of TV production professionals, the best paradigm and the needed features to support content authoring for multiscreen viewing experiences.